In Proceedings of the 2015 International Conference on Autonomous Agents and Multiagent Systems (AAMAS ’15). (Extended Abstract) 2015, pp 1899-1900. Several agent-based frameworks have been proposed to investigate the possible reasons that lead humans to act in the interest of others while giving up individual gains. In this paper we propose a novel framework for analyzing this phenomenon based on the notions of social importance and local discrimination. We propose a “Favors Game”, where a recipient agent can “claim” a favor to a donor agent, which may in turn “confer” its request at the expense of a certain cost. 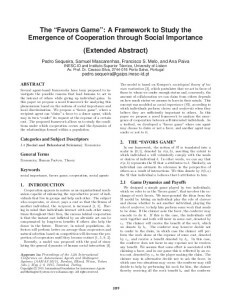 The proposed framework allows us to study the conditions under which cooperation occurs and the dynamics of the relationships formed within a population.